By the way, a big thanks goes to Edgar Merino for pointing out some simplifications to the code that have now been implemented in this example. If you would like to try it out, click on this Java Web Start link, keeping in mind that you'll need at least JRE 6. Also, installing Java SE 6 update 10 will give you faster deployment time. As I mentioned in the JavaFX SDK Packages are Taking Shape post, JavaFX is adopting a graphical "node-centric" approach to UI development, so nearly everything in a JavaFX user interface is a Node. When you want to create your own custom node, you'll extend the CustomNode class, giving it your desired attributes and behavior. Shown below is the code for the custom node in the example that displays an image and responds to mouse events (e.g. becoming more translucent and showing the text when rolling the mouse over). Note: You may be wondering why I don't just use the Button class that is located in the javafx.ext.swing package. The reason is that the Button class is a Component, not a Node, and I think that it is best to follow the stated direction of moving to a node-centric approach. At some point there will be a button that subclasses Node, at which point the ButtonNode class in this example may not be needed anymore. * for fade-in and fade-out behavior. This new class introduces attributes for storing the image and text that will appear on the custom node. The create() function returns the declarative expression of our custom node's UI appearance and behavior. The Glow effect in the javafx.scene.effect package is used to brighten the image when clicked. The opacity of the image, the size of the image, and the title of the custom node, are transitioned as the mouse enters and exits the button. A Timeline is employed to make these transitions gradual. After adjusting opacity and applying a glow effect, the onMouseClicked function calls the action() function attribute defined earlier in the listing. This make our custom node behave like the familiar Button. Arranging the ButtonNode instances into a "menu"
Notice that the action attributes are assigned functions that are called whenever the user clicks the mouse on the corresponding ButtonNode, as pointed out earlier. Also notice the the __DIR__ expression evaluates to the directory in which the CLASS file resides. 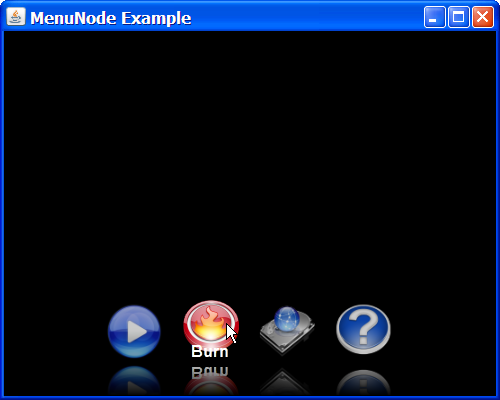 In this case, the graphical images are located in a com/javafxpert/menu_node_example/ui/icons directory. By the way, the images for this article can be downloaded so that you can build and run this example with the graphics. This is a zip file that you can expand in the project's classpath. toogle doesn't exists anymore? Do you have any idea what I can use instead? Very nice article. I'm all agree with you. I'm fan of JavaFX. I developed some custom nodes and will publish them in very near future. MenuNode is alo fantastic. Also please add Linux support ASAP ;) Linux systems are getting more users day by day. That is a zip file that you can expand in the project's classpath.